Based on the humble zebra fish (beloved of researchers), the GloFish was originally bred by Singapore scientists to help fight environmental pollution. The fish fluoresce more readily in the presence of environmental pollutants. Update (Apr 02 2004): California regulators decided yesterday to reconsider the ban on biotech household pets after one commissioner was lobbied by his wife. She has an aquarium at home and wants to buy fluorescent fish. Commissioners voted 3-1 to seek an updated recommendation from the Department of Fish and Game and to hold public hearings. 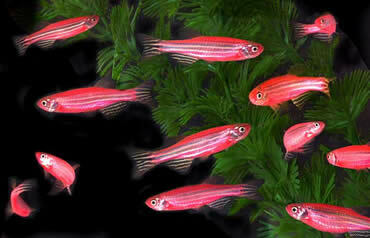 California is the only state that has banned the brightly striped fish. Ahh, the wife lobby. Makers of the GloFish do not believe that the modified fish pose a danger to the environment, and that their fluorescence would place them at a disadvantage in a competitive natural environment. In a happy note for future Christmas holiday buyers, the researchers have also created green fish by injecting them with a marker gene from jellyfish. The two varieties of fish, swimming together, would certainly make a festive holiday display. However, the green fish may not be ready in time for Christmas this year. Science fiction fans have been waiting for attractive and practical genetically modified pets like the chairdog from Frank Herbert's 1969 novel Whipping Star for more than a generation.